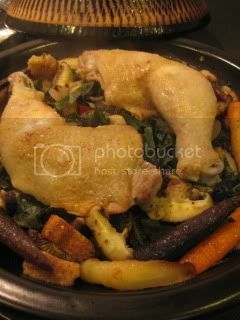 I was going through different cooking magazines, and this dish with chicken and swiss chard caught my eyes. I thought they make a nice combination for one pot donabe dish. So, I was inspired to use these ingredients and made into my own donabe dish! For this dish, I use my very versatile tagine-style donabe, "Fukkura-san". 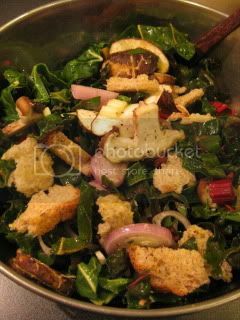 First, I mixed together swiss chard, toasted bread, pine nuts, garlic, shallot, black currant, cranberries (both dry kinds), shiitake mushrooms, with oregano, cumin, green pepper flakes, olive oil, salt and pepper. The mixture was so beautiful that it looked like a salad! The mixture was spread in the skillet of Fukkura-san. 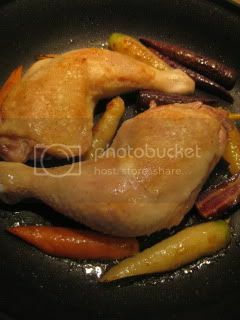 Then, I seared chicken legs until golden brown with some heirloom carrots in a pan. 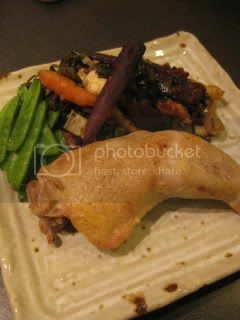 They were transferred to the skillet of Fukkura-san be arranged on top of the vegetables. 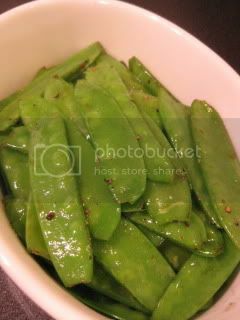 After transferring the chicken and carrots, I used the same pan (with some chicken jus left) to make sauteed snow peas...which made a nice side dish! Fukkura-san was covered and cooked over medium heat on gas stove for about 20 minutes. The dish was ready! It smelled so wonderful. 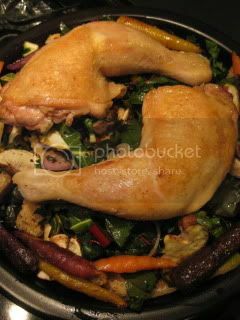 Chicken was so juicy, and the vegetables were nicely tender, and they soaked up the flavors of the chicken nicely. Brilliant dish! I posted the recipe on toiro's website, so hope you will try it home.